Why Membership Is So Important. 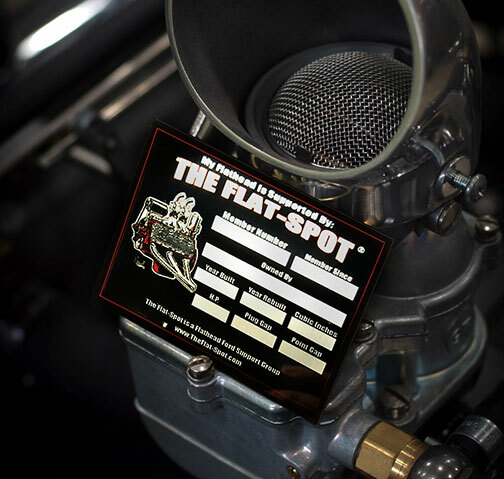 The Flat-Spot has seen amazing growth and many of our members have said they would not have reached their engine goals if not for The Flat-Spot community. We understand that Facebook is not forever. Our group’s success has signaled us to the fact that we need to move beyond Facebook to establish a network of members, friends and teachers. Most of all we need your help to expand The Flat-Spot in your home town. Your membership in our group allows us the resources to reach beyond Facebook and become a national group. A group of committed enthusiasts devoted to the continuation and preservation of stock and custom Flathead Fords for a new generation to enjoy. This is just a taste of our top dealers. The Flat-Spot is actively approaching new dealers daily, working to expand our discount program. 1. A custom stamped (with your member number) vintage styled firewall data tag. Outfit your hot rod and make your buddies jealous… There is also space for you to include your engine’s data. 2. A Flat-Spot Premium Membership packet: This packet is designed to let you know a little more about what we are doing with your contribution. It will include 2 Flat-Spot decals for your tool box or side window and a Free Gift. 3. Access to our dealer discount program. A 10% discount on all Flat-Spot products and services is just the start. We plan to approach more companies and work to get our premium members better discounts on the things you need to keep your restoration going. 5. Group Newsletter: We will be adding Premium Members to a monthly email list. The email is where you’re going to see whats new and also where many of our top discount dealers are going to feature monthly specials. Speedway Motors and CW Moss have already committed to offering our members exclusive monthly deals. So it’s worth seeing how we can save you more.